Hoje é dia de Bicho! The completion of the project is TODAY CRITTER DAY! is an innovative initiative that seeks to disseminate environmental awareness for children and youth of the Federal District through active participation in recreational activities that unite culture and the environment towards a better future. TODAY IS DAY OF THE ANIMAL! innovates to promote an exclusive event for a special audience. Innovates to bring wildlife and people. Inova to mobilize parents, educators and ordinary citizens to contribute to the formation of youth consciousness. Inova to renew. Renova to perpetuate. 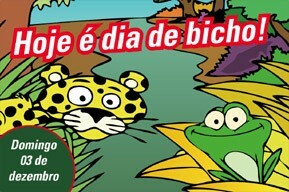 A day of communion between man and nature will happen in the Brasilia Zoo on December 3, 2006. Artists circus, theater, music, book launch, walks with monitors and many other activities are planned to help form new citizens. New environmental advocates. TODAY IS DAY OF THE ANIMAL! Today is the day to learn through play how to build a better future for Brasilia, in Brazil and the world!